Entrepreneurship is a proven pathway for Americans from all walks of life to build income, independence and financial security for themselves, their families, their employees and their communities. Rural entrepreneurs start businesses at higher rates than their urban counterparts and have higher five-year business survival rates, and these businesses play a particularly vital role in rural America, creating roughly two-thirds of new jobs and supporting the economic and social wellbeing of their communities. Despite the importance of local businesses to rural communities, little research has been done to try to understand the unique strengths and challenges faced by rural small business owners, which is critical in light of the fact that rural communities have struggled to recover economically from the Great Recession. To better understand the state of rural small businesses, Small Business Majority conducted a three-pronged research project to explore the unique needs and challenges of small business owners in rural communities. We held focus groups with small business owners in rural communities in Georgia, Mississippi, New Mexico and Texas, and we held roundtable discussions with key stakeholders including Small Business Development Centers (SBDCs), chambers of commerce, economic development organizations and local officials within these rural small business ecosystems in the same four states. We supplemented these qualitative findings with a national poll of rural (defined by U.S. Census codes) small business owners across America. Our research identified that rural entrepreneurs are optimistic about economic conditions in their areas, but they face unique barriers, including a lack of awareness of resources available to them and challenges accessing local business support programs when they are aware of them. Rural small business owners also face challenges in accessing financing options, finding and retaining a talented workforce, and a lack of proximity to broadband service, healthcare providers and other goods and services. Rural small business owners are optimistic about economic conditions: Rural small business owners surveyed in the scientific opinion poll were asked to rate the current economic conditions for small businesses like theirs in their community today on a scale of zero to ten. Sixty-eight percent rated their local economy as a 6 or better. Access to capital is particularly challenging for rural entrepreneurs: Small business owners in focus groups and stakeholder roundtables identified access to capital as a major challenge for rural small business owners. 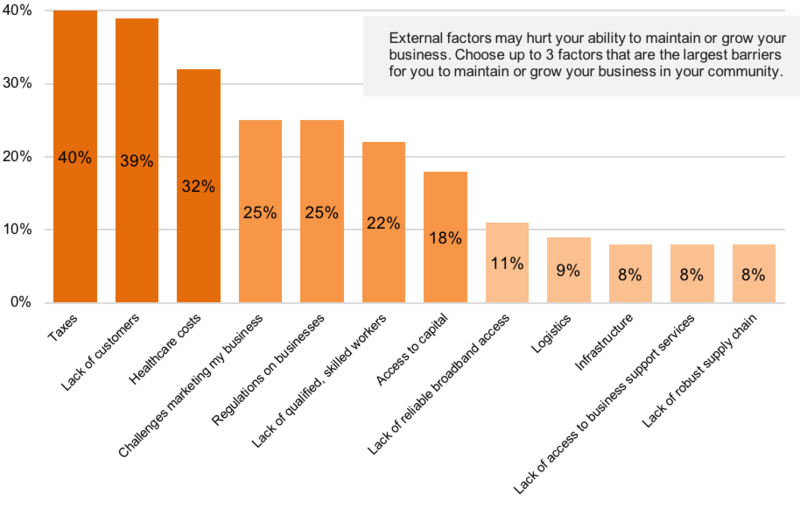 Four in 10 poll respondents also reported accessing capital is a personal problem for them. Rural entrepreneurs need more education and solutions in accessing capital: Results from the poll, small business focus groups and stakeholder roundtables identified some discrepancies regarding awareness of local technical assistance providers and education around small business financing. According to the poll, 73% reported they are very or somewhat confident they know all the loan and capital options available in their community; however, 59% also agreed they need more information on the types of capital sources that their business might benefit from. Rural employers struggle greatly to maintain a qualified workforce: Across all focus groups, participants stressed that good employees are difficult to find and they can’t compete for more educated or experienced employees. The poll found more evidence to support these beliefs, with 73% of respondents saying a lack of economic opportunity forces people to leave their community. Healthcare costs and lack of providers are a significant concern of rural entrepreneurs: Roundtable participants identified healthcare costs and availability of providers as a major concern, with most respondents reporting that their only option for care required traveling more than 30 minutes. What’s more, almost 1 in 3 rural small business owners (32%) rated healthcare costs as one of the top issues facing their business. Other identified barriers include high state and federal tax burdens, poor infrastructure and inadequate broadband access and distance from other goods and services.